In the middle of February a 60-degree day is a rare blessing. It's a promise of spring-yet-to-come, but everyone knows it won't last long and it's best to take advantage of it while you still can! We had one such day recently and decided to take a short trip to Weston Bend State Park. 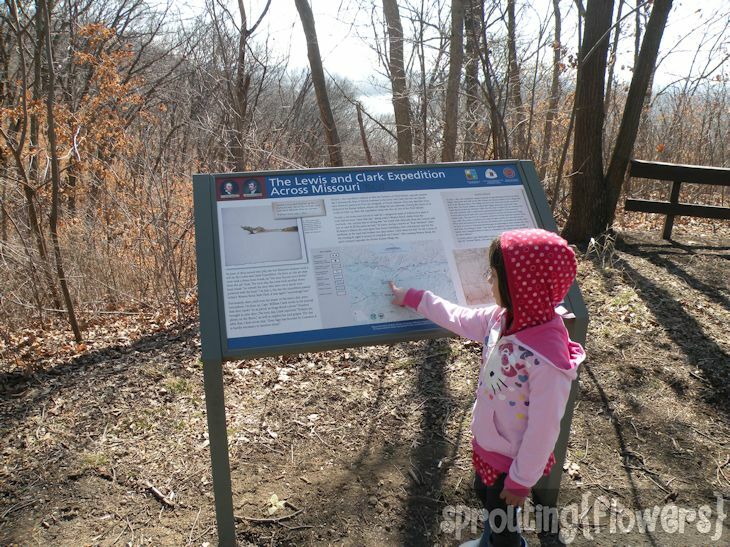 Miss M stops to point out the "here-o-glyph" on the map. As far as vegetation goes, it's still the dead of winter. Nothing has come to life yet, partially due to the awful drought we're experiencing, and partially because it's still early in the year. As Miss M put it, "Everything is brown and gray and dull." I've noticed, though, that when the trees are bare and the underbrush has died back for the winter, you really get a chance to appreciate the different shapes of the trees. 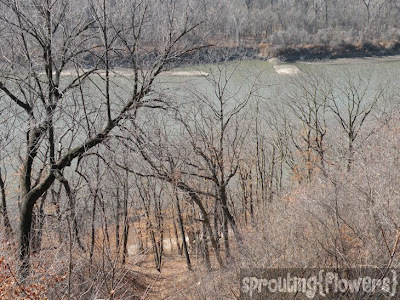 Bare trees line the Missouri River. 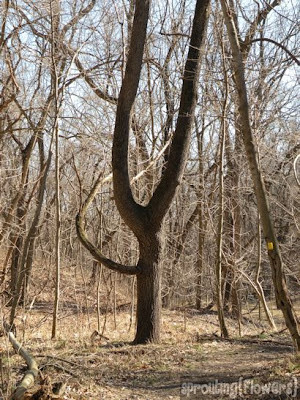 This tree looks like a giant slingshot! 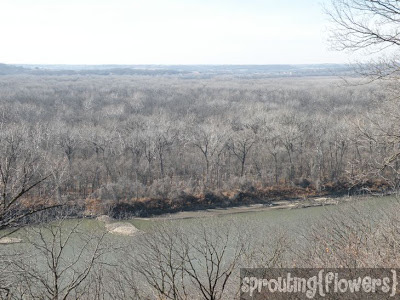 Our first stop was the scenic overlook that provides a sweeping view of the Missouri River. The kids thought it was fun that we could stand in Missouri and look across the river to see Kansas. View from the overlook across the Missouri River into Kansas. After hanging out on the overlook a while, we decided to hike the 0.7 mile Harpst trail. The kids loved it! Miss M probably ran the whole-thing-times-three because she'd run ahead, then run back to us, then run on ahead again. She loved looking out for the next blaze mark and finding tree stumps to stand on. 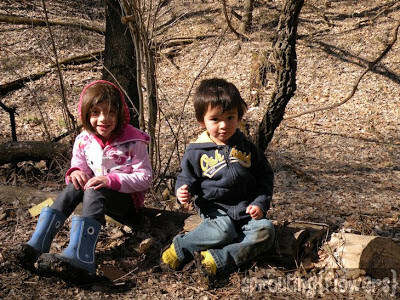 I knew it would be muddy, so I insisted the kids wear their rain boots. 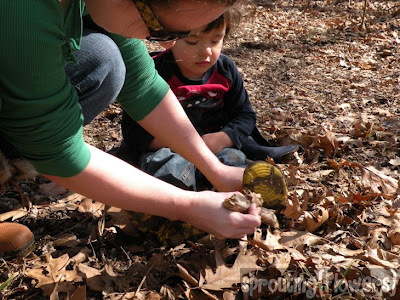 What I didn't count on was how slippery the mud would be! 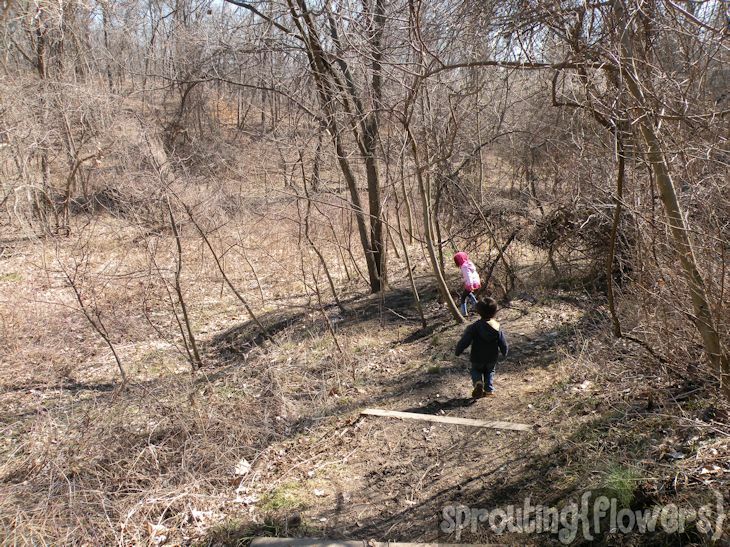 Some parts of the trail were quite steep and the gooey Missouri mud made it a bit treacherous. Hubby carefully avoiding the mud by walking on leaves with Miss M tromping happily right on through! After a while the sticky mud got heavy and we needed a break to scrape some from the bottoms of our feet! Imagine trekking through wilderness like that mile upon mile. It gives me a new respect for our ancestors. 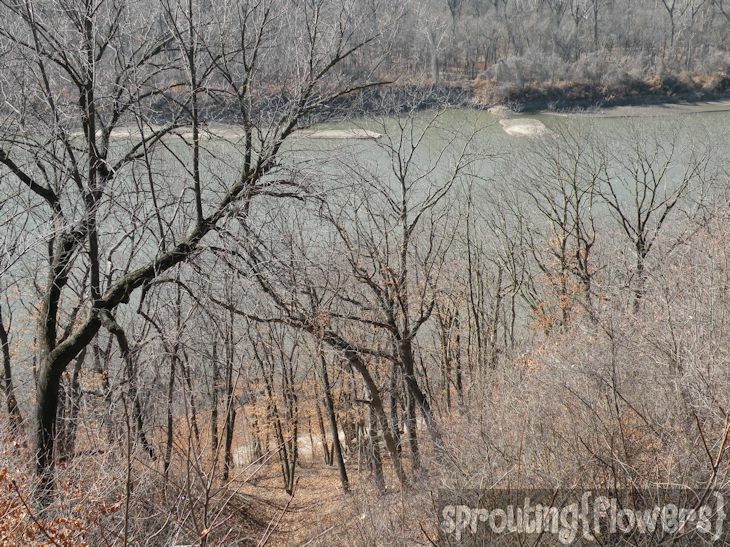 It was a wonderful family outing and we hope to go back when spring arrives to see what changes have taken place along the Missouri River. 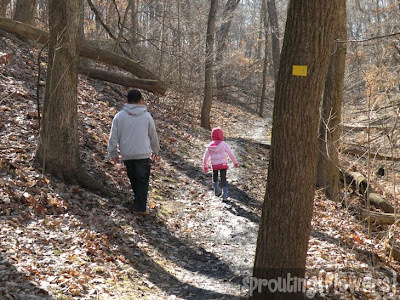 Where do you like to take nature walks?